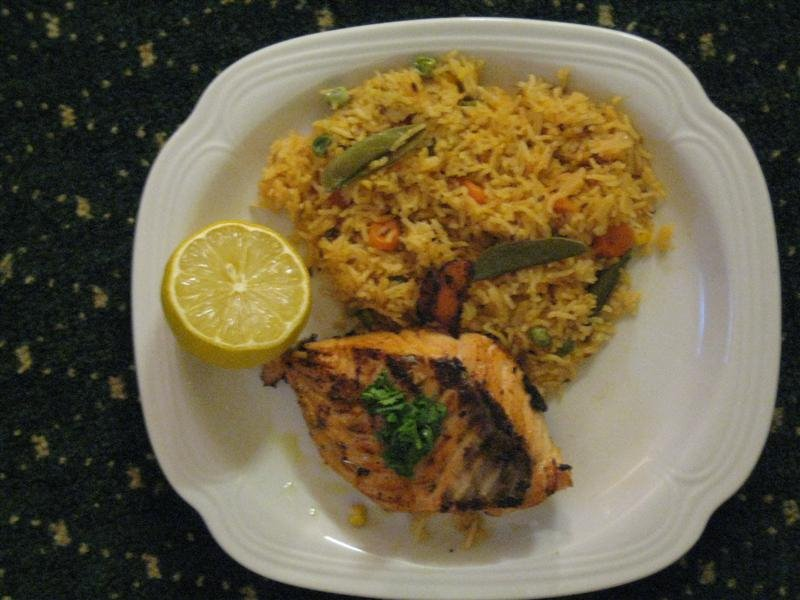 This recipe is for Grilled Salmon served with tangy tomato rice. Juice of 1 Lemon, and take lemon zest for same. Mix all the ingredients for marinating and marinate the fish for 1 night before or 7-8 hrs before you cook. Take a non stick skillet and add zeera/cumin seeds to 2 tsp of vegetable/olive oil. Now add salt and red chili powder. Add mix vegetables and let them cook till they turn crispy light brown. Now add tomato puree/sauce to it and let it cook for 2-5 minutes. Add soaked rice to it without water and stir it for two minutes until each rice grain is coated with your mixture. Now add 1 to 1 ½ cups of water and let it cook till 15-20 minutes. Till Rice cooks start with fish. When it is medium heated add the fish, do not add sauce just fish. Let the fish cook on each side for 3-5 minutes until it is golden brown. If you flip before this fish will not be cooked properly and will break while flipping. Heat on low heat leftover marinating sauce and 2 tsp of vinegar and 1 tsp. of vinegar. I love recipes with fish they are always so healthy and I love grilling.